A notable amount of Mac users have discovered that a random OS X password popup window can appear from iCloud, FaceTime, or Messages, any of each asking for the respective iCloud password. The random password request is very non-specific and just has the logo, “iCloud Password – Please enter your password for email@address” with options to cancel or ‘Log In’. This seems to happen in OS X Mavericks with some regularity lately, but it can happen in OS X Yosemite too. Getting an unsolicited password prompt is enough to spook many Mac users, and that’s for good reason given the increasing importance of protecting passwords and personal data, but fortunately the vast majority of the time these popups are nothing sketchy at all. Nonetheless, if you’re skeptical of the prompt, you can always scan OS X for adware first. Either way, we’re going to show you how to safely address the weird random iCloud password popup prompt and make it stop showing up, thus if you are concerned about the authenticity of the alerts you can handle it without worry. It usually appears completely at random and not after any particular attempt to use iCloud, iMessage, FaceTime, or any other service, which is what makes it so unusual. Sometimes you may see it on system boot, or logging back in again, or waking from sleep. Why go this route, rather than just logging in with the alert window? Two reasons: one, the iCloud preference panel approach seems to actually work to put an end to the popup message. And second, it’s to protect or maybe just train against a theoretical situation, where perhaps a piece of adware or junkware could theoretically summon a similar popup window from a web browser rather than the OS, but with malicious intention for harvesting data or who knows what other scenario. That latter scenario may be very unlikely, but it’s just good practice to not trust random password prompts, regardless of where they come from. For what it’s worth, iPhone and iPad users may recall that a similar issue sometimes happens in iOS, where a similar password popup appears constantly out of nowhere. There are a few theories as to why these popups come up at random, but typically you’ll see them after you’ve logged into another Mac or iOS device with iCloud, or maybe after having changed an Apple ID in OS X on a Mac. Also, it could be as simple as a brief service disruption between your computer and iCloud services, whether because of local internet connectivity issues, or remote server issues. I’ve been able to trigger the popup in exactly that scenario by slowing my connection down so slow that it stops transmitting data, then trying to use an iCloud service. Either way, the password popup prompt is probably going to be ironed out in a future update to OS X to stop confusing users as it may just be a bug. I am getting this exact message like once or twice a day right now, I repaired my Keychain but that did nothing. I’ll try the log out and back in thing. Makes me think iCloud servers are having issues, maybe it is a communication issue? How did you repair your keychain??? I keep getting the keychain login message and I don’t have a password!! Open keychain. Then go to the menu ‘Keychain Access’ (top left). Then click on ‘Keychain First Aid’. You’ll be asked to put in your username and password (or just password). Then select ‘Verify’ and click start. If there’s anything wrong it will let you know and you can click to fix. Go to Applications then Utilities Folder. Open up Key Chain Access App. Select Passwords under Category. Now on the right column search for Apple ID Authentication should be second to third option down the long list. Double click on it. Enter your passwords and select always allow. That took the pop up alert away. Hope this helps. Thank you; this seems the most promising of all the things I have tried. Will let you know if it doesn’t work. I recently bought a new Macbook and had the situation where it prompted me every time I logged in. However, the prompt would never accept my correct password (as was validated by the System Prefs > iCloud). I ended up having to generate an application password (since I use 2 factor auth) to silence it. Same happened to me. I’ve was plagued with the password pop-up ever since I initiated 2-step verification. I kept entering my iCloud password only to realise it needed an app specific password. Drove me crazy. I still think there’s a bug in the iCloud system somewhere. Having laboriously checked all my devices and generated app specific passwords where necessary, the office iMac started asking for the password again. Sigh. The saga continues. I have exact the same problem. Now, I even can´t sign in into iCloud without constantly having to enter passwords for iCloud, FaceTime and iMessage… it looks like this problem started when initiating 2-step verification. You are correct. 2-step verification has frustrated me beyond measure, even after disabling it I can’t even use Mail without constantly being reprimanded about connecting to iCloud. Thanks for this article. That popup happened to me on my Mac a few months ago and it sorta nagged at me ever since, thinking maybe someone stole my password. Yup, these type of random popups cause quite a scare for Mac and iPhone users! Did someone steal the password, did someone log me out, is this thing even legit? It all runs through your head, got to have Apple lock this stuff down well and not spook us like that! I too have been recently having this proble on my iPhone 6 using i0S 8 latest version. Any more specific info on how to deal with this on an iPhone would be helpful. I have this problem, but only when opening iTunes. it pops up 3 times, every time i open it. I have to enter the password each time, it has been happening since Mavericks, never stopped in Yosemite. …But I don’t /have/ an iCloud to connect to. And the store is disabled on this machine. I wish it wouldn’t ask me for a password I don’t have, let alone repeatedly. Now if we could just get a fix for iTunes asking for log in info four to fives times in succession after every time I clear my Safari browser cache and history. Same problem with iTunes: multiple password requests. My simple solution: I no longer use iCloud. Have never been happier or more bug free. I’ve never used iCloud, and have neither ID nor password, yet Yosemite bugs me several times a day with this annoying request. Always comes in pairs, and I have to “cancel” both. Since I have not done this before, my question is, if I chose to keep the data, will it be re-synced correctly when I sign back in? If, however, I select to delete the data, will it be synced again if I sign back in? I got the same thing Ted when I tried to “Sign Out” of iCloud and sign back in. I use iCloud a lot for my calendars and reminders so I was too scared to do it. I’m using Mavericks and this is so annoying. I know the password is right yet it keeps asking for my password every time I restart. Glad to see I’m not the only one with this issue. In your first sentence, you use “amount” when you mean “number”. Rule of thumb: if you can count them individually, it’s number; if not, it’s amount. E.g., number of dollars; amount of money. This issue was fixed for me by creating an app-specific password for Messages, iCloud, and FaceTime. Apple recently enabled that feature. I pressing cancel and all iCloud services continue to work. Same problem here. I use two-factor authentication for iTunes & iCloud. I recently created app-specific passwords for FaceTime & Messages (as now required). But now when I restart my Mac, I keep getting these dialogs which won’t accept my iCloud password. I suspect they’re looking for the App-specific passwords. Anyway, I ended up canceling all these popups and I’m still logged in to iCloud, FaceTime & Messages just fine. Seems like some issues remain with the app-specific passwords for FaceTime & Messages. My father had this issue with his iPhone 6 Plus. I have not seen it on any of my iOS or OS devices. He has also run into the problem where the service doesn’t recognize his password. It has been annoying. I just followed your fix. Hope it works! This password request pop up started after a local U-Verse outage. I had this problem and I don’t use any cloud services. Suspect it was related to logging in to itunes from different machines. Mysteriously, it has stopped. Is there a way to make it stop without logging in? My mac is my work computer. Work doesn’t give me an apple ID and I don’t want to use my personal one on my work computer. One of the various popups I’ve seen indicates password is needed by “Cloudd” and not iCloud. It is bothersome. Now I’m worried what popup I’ve been responding to for months immediately after each re-start. My user account pw doesn’t work but my password manager application’s password does !!!?!? If you’ve been putting your password into a typo-filled web form, you should change your password and then only place your password into fields that you know are legitimate. What do you mean “it may just be a bug”. Of course it’s a bug. Something is happening that has not been prompted and is not required by the user’s action. That’s a bug. I suspect this is due to the fact that Apple hasn’t bothered to roll out two factor authentication to its own apps yet, including Facetime and iMessage. Why not? I tried signing out of iCloud, but then it said a bunch of stuff was going to be deleted. I didn’t like the sound of that so I didn’t sign out. Yes, it did that for me too, very scary to have to delete everything before you can sign out. Your guide did not go over that large part of the detail. But when I read ‘Help’ and realized I do not use their mail, calendar, etc features, and that I could simply sign back in to FindMy iMac, etc, I let it ‘delete’ everything. Finally when all was clear, iCloud let me sign out. Then I just signed back in. The sign in process however was also mis labeled, asking for my Apple id in the same box as asking me to generate a new one. They have a lot to clean up for user interface logic. It started recently on my MacBook Pro with Maverick but I’ve never used iCloud. I use an external hard drive. One reason it started may be when I got my MacBook Pro I started to engage iCloud then stopped short of putting in a password because I changed my mind. I wonder if this will never go away because I did some step that got me that far. Anyway, I won’t give a password. Period. But I do have a fix for those of us who don’t want to use it. Right now I move that popup as far off to the side of the desktop as possible. This leaves a very thin sliver showing, about a 1/4 inch. Not enough to distract me from anything I do. And I tried to move it back, just out of curiosity, and it won’t budge from where I put it! Good! I feel like I’ve put it in my own iCloset! (I’d sign up for one of those if it ever gets created!) But its only enough for a temporary fix cuz who needs a popup you have to move at every reboot. SO, I went to icloud preferences (in system preferences) and noticed it was on. It may turn on automatically at boot up I guess. So I hit cancel. I won’t know if that does it until I reboot. Hopefully it won’t turn on again. If it automatically does turn on and the popup returns, I will live with always taking the extra step of putting it off my desktop. So far, it works for me. PS. Rebooted and no soap. When I go to sys pref – iCloud preferences now, the option to cancel isn’t there because I already turned it off. So it doesn’t automatically turn on. But I still get the pop up. Off to the side it goes. Tried your suggestion and still got the prompt, although suddenly with a new twist. In addition to the prompt I got a message explaining that the password required was an application specific password for Messages. Went to the requisite Apple ID page, generated one and fed it to the annoying dialog prompt and it finally disappeared. But, hey, who cares, at least the Apple *hard*ware functions well/looks good. Passwords are backward technology WTF do they think we are still living in a 60s spy movie or something since u have a password on your iphone or macbook you should only ever have to sighn in once. This article needs to be updated. It is an issue with 2-step authentication. It would seem that the iCloud servers finally want an App-Specific Password for iCloud even though in System Preferences you log in with your AppleID Password. Anybody know the Apple Corp mailing address, so I can write a snail mail, with huge complaint about them refusing to fix this bug. What the heck is going on in Apple Computers? Are they all asleep at the wheel? I am getting a continuous popup saying “Enter password in preferences for Facebook.” after installing the recommended yosemite from the App Store Updates. I have logged in and out several times but the problem persists. Extremely frustrating. I tried clicking iCloud in system preferences but another window opened saying there were “preferences error” and that the iCloud preference pane couldn’t load. What do I do? This fix does not work. If you follow the instructions and it still happens, then what? Here’s what has worked for me so far. I was able to open each of these apps and go to their preferences. I found myself logged in (I don’t remember particularly logging in, it may have been something in a recent upgrade that tries to auto-log in to these apps). I was able to “Sign Out” of each app in the preferences. Haven’t had a pop-up since. I just had this happen for the first time in the 18 months since I bought this computer. I haven’t installed any updates lately, and I don’t use iCloud (in fact I refuse to for a number of security reasons). I haven’t installed any new apps that would require iCloud, nor have I updated Firefox recently which is the browser I use. I got the popup after waking my Mac from sleep, one of the scenarios mentioned. I’m going to have to keep an eye on this to see if it happens again. Hit the “sign out” button, agree to delete whatever it says it’s going to delete, and see if that solves the problem. If I wanted all these headaches (can’t even edit my address book without being asked to enter my gmail password…???) I would have bought Windows 8. If this is the future of Apple, count me OUT. Is anywone there listening to your customers here? What a nightmare. This is a nightmare. When I turn on my mbp, I keep getting the “iMessages password” dialog box. It doesn’t matter what you enter, click cancel, or enter the correct password, it still pops back up in about 5 to 10 seconds. If you do nothing, multiple pop ups will continue to overlap each other. I tried logging into actual iMessages to disable iMessages, and iMessages just freezes and never opens. This feels like an insanely bad virus. I even attempted to go into system preferences to see if I can uncheck at start up but to no avail. Spent 3 hours researching this issue, with no solution. HELP MEEEeeeeee!!! I have exactly the same issue. Ive tried everything I found online so far. Have you resolved this ? If so, please tell me what to do, or I might just throw my laptop out of a window soon. Didn’t fix it for my iMac. Hi, we have had exact my the same problem and for a month we couldnt figure it out. Tonight i had a free minute to have a look at it again and i found that there was a problem with our credit card in that our details were old. I have just update the details and thats that. No more popup👍😃. I hope people find this useful. Tried this. Didn’t seem to match my payment info in iTunes either, which is strange. Lara dlc….thank you for posting this – you’ve probably saved me hours of trawling for a solution. I’ve just had a replacement credit card as I lost mine, so I’ve just updated my iCloud payment details and looks like the problem is solved!! Brilliant! I logged out of iCloud and logged in again; all my reminders and notes have disappeared! Can’t restore reminder app cos I get a crass message about the system requiring it! This just started happening to me on my Macbook Pro that I’ve had for 11 months, running Mavericks. It started when I went to iCloud in Safari and logged in to iCloud through the browser to get to a Pages document saved in iCloud. I do this every single day. But today, a minute after I logged in through Safari, I got the popup to login to iCloud, and then one to login to FaceTime, and then another to login to iMessages. I had to enter my password twice for each of them to get them to go away. Then I got a popup on my iPhone telling me “Your Apple ID and phone number are now being used for iMessage and FaceTime on a new Mac.” Uh, really? You mean the “new Mac” I’ve been using for 11 months? Hmm. I also randomly got the same popup to sign in to iCloud on my phone a couple weeks ago. The only change I’ve made to anything was to update my iPhone and iPad to 8.4. I also just remembered that a few days ago I bought an app and had to update the expiration date on my credit card, because I had forgotten to do it earlier. Wonder if it’s connected. I just updated my computer. There were two security updates that I had been ignoring (probably unwisely) for the past few weeks, one being a firmware update and another a Safari update. So far it seems to have fixed the iCloud/FaceTime/iMessage password popup. Hopefully that was the problem. Type in a few random letters and enter until it asks if you want to reset. Hit reset. When the reset screen comes up, go to Siri and ask her to open settings (I just use setting because it worked for me), immediately it stops the loop, then go about your business, for me no more rolling password requests! Why on earth would I want to log in to iCloud? I don’t use it and will not do so. How can I get rid of the message without logging in to iCloud. I agree. I do not trust the security of iCloud, and I do not feel I can control which data is sent to iCloud. So I don’t want to log in to iCloud. How can we get rid of this message? Pretty poor advice, considering your iCloud data will be wiped off the machine if you follow through. The solution above didn’t work. Three days later, the requests are back. You are making a fairly big assumption that everyone WANTS to be logged into iCloud. 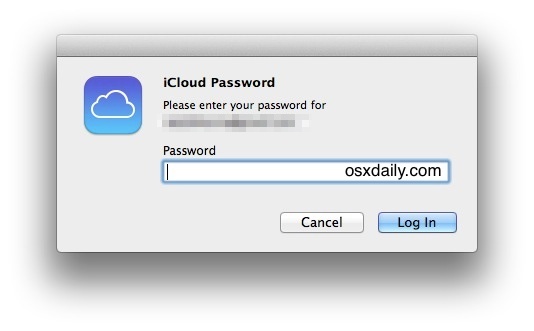 What if you want to “FIX” this pop-up alert problem, but don’t want to log in to iCloud? It is a solution for some only. I have a work laptop & I do not want to connect my iMessages or iCloud, so I do not want to provide a password. FaceTime has an option to turn-off in menu, not like others :-( Both pop-up windows will appear in seconds once ‘Cancel’ button is pressed. Not happy about pop-ups!!! I am getting this all the time on my MacBook Pro. Logging in does nothing to stop the pop ups. Cancelling them does nothing either. I am going to disable two-step verification for my Apple ID, as Apple clearly have not the capability to make it work properly. Seriously, Apple’s OS X is now so stuffed full of bugs and glitches that basic functions I once took for granted are touch and go. Result: frustration. Apple needs to stop adding new features, and just make the basics absolutely bullet-proof. The days of “it just works” are long gone. I am sick to death of so many bugs and errors in Apple software. I’m so happy for you Apple that you are working hard to make this next iPhone 0.0002234mm thinner, but we’d really like it if you’d do this: STOP RELEASING BUGGY SOFTWARE! Seriously, I am not going to plunk down another $1,600 for a new MacBook when the basic operating system functionality does not work. I’m having this same problem, and have tried the above fix suggestion. Now when I try to enter my Apple ID password in the System Prefs, I get this: “An unknown error occurred.” Wow! Thank you SO much for that helpful message! I agree this has being going on way too long an Apple doesn’t seem to want to fix it, it is time to move on to Windows, way cheaper anyway. But I don’t want to log into icloud, in fact I don’t want icloud, I want to turn it off, but Apple says turning it off will delete my files from my computer, but I want my files on my computer, so how can I turn off icloud and not delete my files, and will turning it off stop this irritating popup? Turned on my computer yesterday and out the blue and I started getting the POP UP. FaceTime, ICloud and Find my computer pop ups. Tried everything list and can’t get rid of it. Paid a lot of money for the supposedly bug free Mac systems, maybe its time to just go cheap and return back to Dell. Had the same few days back. Worsening. Then, try to open facetime apps, then select FACETIME beside apple icon on top left. Select preference and sign-out. Same goes with the imessage. This didn’t work for me. When I followed each step, it suggested documents and contacts from my Mac would be deleted. What the heck is Apple doing? They took away iMovie HD and force-dumped a crappy version of iMovie 11 on us and now this issue with ALL MY MACS having to mess with the iCloud password each time I start any and all Macs I use. I’d rather simply enter my password if and when I decide to sign on and into iCloud. I’ve never used a FaceTime app nor even know if they are installed on my MacBook air or my other 3 desktop Macs. This is one of the reasons I’m turning off automatic updates because Apple is irritating people with forced compliance. Several years ago I did an update and Apple removed iMovie HD and replaced it with iPuke (I mean iMovie 11) which pales in comparison to iMovie HD and now this password from Hell problem that is entirely to blame on the folks in Cupertino. Found and opened FaceTime on my MacBook Air… I’ll try what you have suggested and hope it will work. Thanks for the tip. Nope… It sends an Apple ID Verification Code number to my iPhone and as I am working on my MacBook Air, there is no place anywhere to enter the 6 digit code. I am starting to miss Steve Jobs (and Prince)… Arggh! Once you get your 6 digit code just add it to the end of your password and enter the combination in the password box. While this post does address the issue of avoiding giving one’s password to a potential hacker’s pop up, it does not help those of us who do not want any of our personal data (documents, music, photos,…) stored on some large mainframe computer in some obscure part of the world (in the U.S. or elsewhere) where some stranger who manages that mainframe computer can have access to our data at any time. If you’re so concerned about a hacker getting your info, why are you using the Cloud to begin with? It would be great if someone would post instructions on how to bypass the Cloud altogether. Last I spoke with an Apple rep, it was not possible. WHY??? With hackers everywhere, and the Patriot Act still in place, this is a little too close for comfort for those of us who educate ourselves with real news and stay informed on the issues. Perhaps someone should start a petition for Apple to add a feature that allows us to bypass the Cloud (a remote mainframe computer managed by strangers) altogether. I’d sign it. thank you for saving me from going down this same path – NO CLOUD and I want Apple to tell me how to choose no cloud. ever. for anything. I tried to sign out but it won’t sign out of iCloud’s it just keeps saying I will be deleting everything on the Mac ? It will not sign out. Any other suggestions ? I updated my payment information. * Opened FaceTime, preferences, Sign Out. FaceTime got messed up when they started making your computer ring when you got a phone call (without asking or telling you how to disable it). I thought that I had addressed this before, but maybe the rolling sign-in windows are a downstream result of this move? is the web view of the system preferences, account details. This is an old thread, but I’m still having this issue. I followed the advice posted above and only succeeded in having all of my smart mailboxes for all my clients and various projects deleted from my mail program. And the pop up box still keeps popping up every day. Trust apple to make your life miserable in very artistic way! now I am waiting for ‘account recovery’ due to the stupid thing! no FIX worked for me, keeps coming and coming! already throw my iPhone and moved to Xiaomi Mi6 for that exact reason! just gonna skip the stupid iCloud and do external macbook backups ! I get the pop- up, every second for 3 minute, then pause for 20 minutes, then repeat. Its not something the staff at Apple Store, Cambridge, UK, know what to deal with. Thy tell me to go to Apple help online. That usually takes hours, so I don’t expect it won’t – hours I don’t have. Talk about MALWARE, this is it !